I live on a sailboat and Poe Dameron is stuck inside one of my potties. That’s right….you read it right…the hunky hero of the resistance is stuck inside one of my potties and won’t come out. He apparently decided to go swimming in my forward head (potty) sometime in late October; but of course this didn’t all get communicated till last Friday morning. After several days of interesting noises from that front head, our oldest daughter decided to tell us that the 1/2 inch plastic Poe had taken a swim in the toilet somehow….and not come out. I was hoping he would matriculate all the way through the system and get sucked out by our friendly Saturday morning service (hate Saturday morning as the time the service comes to clean us) but it didn’t happen. So Poe’s still in there somewhere, doing his doody. I’m not thrilled about this. On our first boat, we took out a boatload of guests once and even after informing them of the fact that NOTHING goes in the head that’s not natural (if you know what I mean), they still found a way to flush at least a half pound of wet wipes and baby crap down one of the toilets. $300 dollars and 3 days later, we found this ball of joy stuck in a pipe and got it out. But on the flip side, that’s how I met Fransisco Cedillo of Cedillo Marine, one of the smartest marine fixers in the area. On this boat, hotwife and kids LOVE to decorate with every sort of plastic thing you can imagine for holidays. One of those things is 4th of July decorations; and I’m here to personally report that once just a bit of that plastic colored grass stuff gets into your marine head, it’s a killer. So (in August) on this boat we had to get the head torn apart to find three strands of that little plastic grass clogging the front head macerator, for another 2 hour + travel charge. Again, didn’t make me very happy joy joy. Now we have 1/2 inch plastic Poe Dameron MIA from the Resistance and probably down the front head. Why do we give the kids 1/2 inch action figures ? I can’t answer this question. But I do know that if this head and macerator break, I’m not gonna replace them with another head that takes power and fresh water- I’M OVER POWERED FRESH WATER HEADS for a Bluewater sailboat. I’m also over the smell from the holding tanks, leaky and full holding tanks and smelly hoses. Every day I get complaints from Hotwife over the smells that imitate from the tanks. I’m ready to move to an Airhead, we just have to look carefully at the costs with everything else we have going on right now. 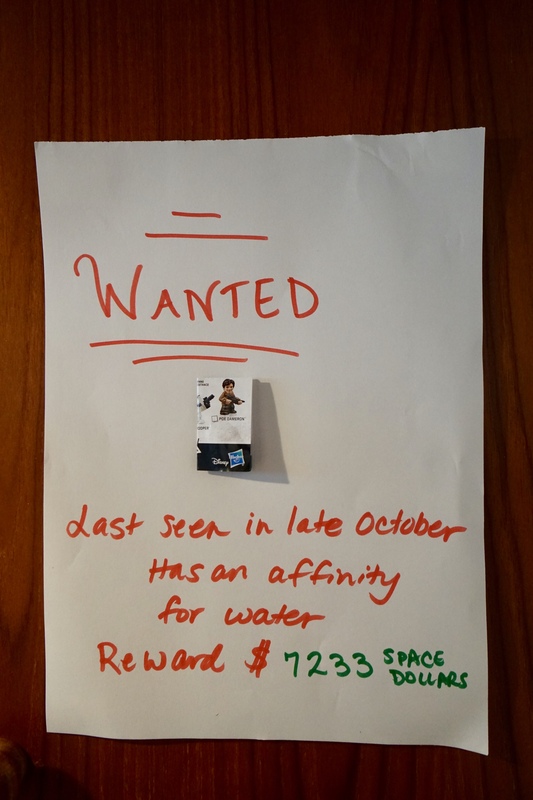 oh, I’m here imagining your daughter was so preoccupied with worry about her missing figurine and not wanting to tell you where it went – kiddos learn quickly that boats are expensive. Nope, she just didn’t tell us, wasn’t really worried about the missing action figure!